Film review – Ant-Man (Peyton Reed, 2015) | Cinema, etc. The problem that many British viewers of this film will have when viewing this film is a pining for what could have been. Edgar Wright and Joe Cornish had for a long time both been attached to the film, the former as director and both as co-writers. Both are extremely well-known amongst the geeks of Britain and the fact they were teaming up was an absolute dream. Edgar Wright proved what he could do when given the freedom of the source material when he directed the excellent Scott Pilgrim vs The World in 2010. 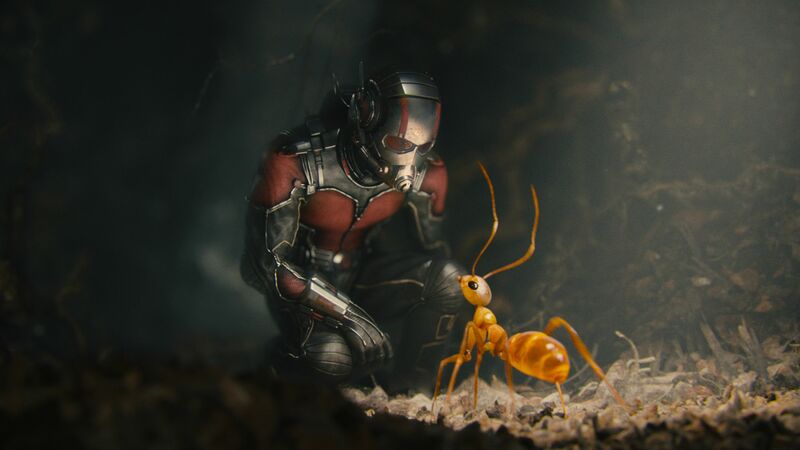 Whilst the Ant-Man series wasn’t as well known as the likes of X-Men and Spiderman, in the right hands it had the potential to be a great film. Phenomenal powers, itty bitty living space. However, it slowly became apparent that Marvel had a different idea of the direction it should take. In an interview with Mike Ryan of the Huffington Post, Edgar Wright said “It is pretty standalone in the way we’re linking it to the others. I like to make it standalone because I think the premise of it needs time. I want to put the crazy premise of it into a real world, which is why I think Iron Man really works because it’s a relatively simple universe; it’s relatable.” Clearly Marvel wanted the film to be set in the Marvel Cinematic Universe and the compromises required to slot it in with Thor, Iron Man and the clan didn’t sit well with Wright and Cornish. With not long to go before release date – 420 days to be precise – the pair (along with director of photography Bill Pope) co-announced with Marvel Studios that they were leaving the project, citing “differences in their vision of the film”. What’s really frustrating is that the script has some very Wright/Cornish-esque humour in there. One of the large scale fights near the climax of the film happens around a Thomas the Tank Engine toy train track. Anyone familiar with Joe Cornish’s route to fame in the 90s will see the likelihood that this was one from him. Or maybe Peyton Reed is a big fan of Series 2, Episode 18 of the original Thomas the Tank Engine series “Thomas Comes To Breakfast”, which first aired in the UK in October 1986. The one saving grace of the film is Paul Rudd doing and excellent job as Scott Lang, the thief-turned-hero who wants to make up for lost time with his daughter. His humour and sharp wit make the journey through the film entirely pleasurable. He is a great comedic actor and the film has benefited from his presence on the rewriting team. However, for all the good that is done by some great work in the cast (Michael Peña is hilarious throughout), we keep getting reminders that this is two films woven into one. The worst moment of the film comes when there’s an oblique reference to The Avengers, which sticks out like a sore thumb. Just as we are forgetting about it, Falcon arrives on the scene. Yes that’s right, Anthony Mackie has his very own cameo role in everyone’s eleventh-favourite Avenger (12th if you include Ant-Man, 13th if you include Nick Fury… who knows where by the time Civil War is released). It’s so pointless and so clearly an afterthought that it not only doesn’t help fit it in with the Marvel Cinematic Universe but rather actually just causes a detrimental effect on the absorbing world that was almost being created in this film. It’s a shame that we will never see that Wright/Cornish film that never was. It must be said that it was unlikely to ever see the light of day without some serious compromises, but as two huge fans of Marvel comic books that was never going to happen. Instead we’re left with a reasonable film with some rewarding moments, which never really gets going because it is so disjointed. Ant-Man is out at cinemas globally now.